During June 1998, four PIT volunteers—Eileen Cohen, Alice Robrish, Shauna McMahon, and Vince Yukelish—assisted Ketchikan Area FS archaeologists John Autrey and Martin Stanford in site monitoring, mapping, recording, and conducting surveys for new or unverified site locations. The intense 12-day work adventure covered approximately 72 nautical miles of water travel by kayaks, with five tent camps established along the way. The study area was on the north end of Revillagigedo Island, within Misty Fiord National Monument and Wilderness Area and Ketchikan Ranger District. Many of the work locations and place names we encountered either originated with the Tlingit culture or had been named during the explorations of George Vancouver in 1793. The weather was exceptionally good, with light winds and sunny skies for the first eight days of the trip, and overcast with light rains during the last four days. The gnats and flies were extremely bad at some locations, which provided opportunities for the display of fashionable head nets. Initially, the volunteers were provided informational materials and safety-orientation sessions on “leave-no-trace” camping ethics, bear safety, and kayak training. 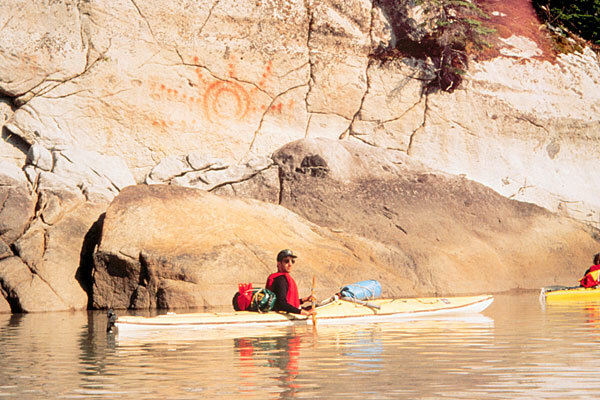 They soon found that applying wilderness survival skills, conducting archaeological mapping and documentation, traveling by kayak, and camping primitively in bear country requires around-the-clock effort and attention. During those brief interludes between periods of physical exertion, the group exchanged philosophies, discussed management issues, coined new words such as a variation of bioturbation to describe ground disturbance from sitting, or talked about the agenda for the following day. In spite of the many pleasant distractions, all members of the team were always on the alert for the safety of the other group members. We monitored the site condition of the Fitzgibbon Cove hearth and midden, Burroughs Bay Saltery and Village, Klahini River Village, the Burroughs Bay Pictograph site, the Cow Creek fish traps and historical-period site, rock alignments, another historical-period site, and a CCC recreation shelter. We also located, mapped, and documented additional sites, including the Saks Cove stone fish trap, the 1893 United States Coast and Geodetic Survey Meridian Observatory established prior to the international boundary survey with Canada, the Herman Creek Historic Cabin, the Short Bay rock alignments and historical-period site, the Bailey Bay shell midden, culturally modified trees located along the way, and two native place-name locations that had been reported by T. T. Waterman in 1922. Several unverified site locations were investigated: a fortified village site reported by Vancouver in 1793 and three previously recorded rock art sites. None of these site locations could be verified, in spite of intensive efforts to relocate them. Two additional CCC-era recreational shelters could not be investigated because of dangerous high-water conditions at the Reflection Lake Shelter, and a lack of time prevented monitoring activities at the Long Lake shelter.